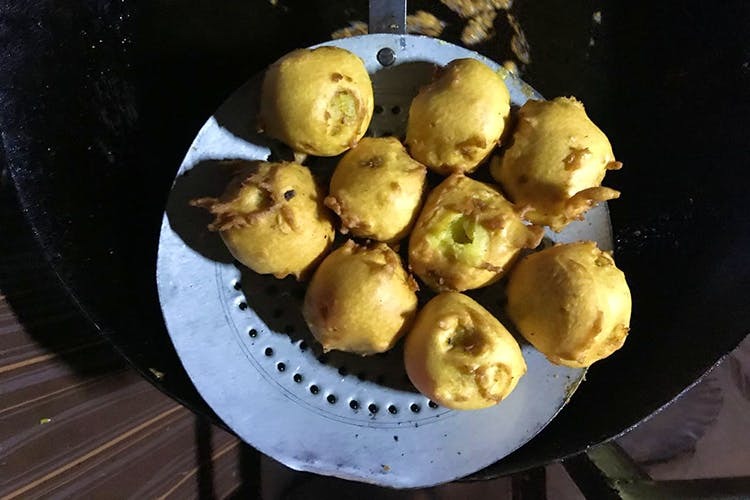 A small cart in Indiranagar, Lokesh Chaat dishes out one of the best vada pavs that we have had in town. Plus, you also get eight kinds of pav bhajji and tawa pulao too! Come 4 pm every day, the lane next to CMH Park comes alive with a mini food street of sorts with three to four carts dishing out masala puris, 99 varieties dosas, and chaat. We say skip all that and head to the first cart in the lane, Lokesh Vada Pav & Pav Bhajji. In fact, the place so popular that it has its own Google Location. The cart boldly declares that it serves Mumbai-style vada pav and pav bhajji and from what we have had, the claim holds true. Oh, and the best part is you can bust your hunger under the INR 100 mark since everything on their menu is under INR 100. It’s the vada pavs that sells like, well hot vada pavs, that you need to try first. Pick from the regular, plain or go all-out with the greasy, cheesy (or buttery) option. In either case, you will order for another round or at least takeaway. The place gets crowded around 6 pm, so we suggest you pop in during opening hours and order yourself one. Perfect 4 pm hunger busters they are!